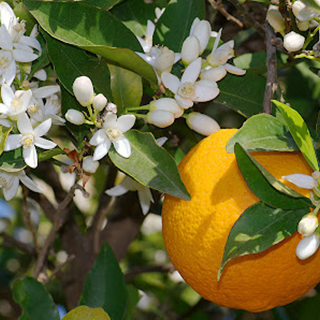 Being a hybrid between Citrus maxima (pomelo) and Citrus reticulata (mandarin), Bitter orange, Seville orange, sour orange, bigarade orange, or marmalade orange refers to a citrus tree and its fruit. Many varieties of bitter orange are used for their essential oil while the Seville orange variety is used in the production of marmalade. Bitter orange is employed in herbal medicine as a stimulant and appetite suppressant, due to its active ingredient, synephrine. A syrup and an elixir are used for flavouring, and a wine as a vehicle for medicines. Use 1/2 to 1 drachm (2-3ml). 1/2 to 1 drachm (2-3ml) per day as dietary supplement to act as a weight-loss aid and appetite suppressant. 4 to 8 drachms (15-29ml). Sour orange trees volunteer readily from self-sown seeds. As generally grown for rootstock for sweet oranges, they are raised in nurseries for 1 or 2 years and then budded. Growth of the seedlings, especially in diameter, has been expedited by weekly applications of gibberellic acid to the stems, making it possible to bud them much earlier. Harvested beginning in late fall and the harvest continues through spring depending upon the region and climate.